The double bottom is the world’s most stressful chart pattern. It forms after a significant price decline. The first low in the pattern creates substantial panic and fear in most investors. The second low in the pattern is “softer”, but no less dangerous to emotionally vulnerable investors. The volume is generally weak and the price action makes investors feel like they are in some kind of financial gulag. Then the sun bursts out from behind those financial clouds, and glorious upside action begins! 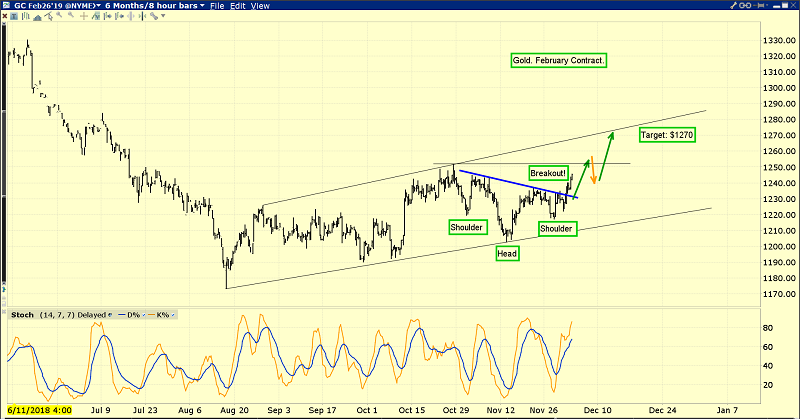 Spectacular price action on this daily gold chart. The long term fundamentals and liquidity flows for gold should never be confused with the medium or short term. In the long term, the biggest driver of gold price appreciation is the Chindian “wealth effect”. It’s all about Chinese and Indian citizens growing their standard of living and buying ever-more gold to celebrate the good times. In the West, inflation is the most potent driver of the gold price and America is beginning an enormous inflation cycle that will likely continue for fifteen to twenty years. As Chindians bring respect to gold as an asset class, Western gold bugs won’t need to hide in the closet when they buy it because everybody will be able to get it online from companies like Amazon. It will be as mundane as buying a coffee at Starbucks is now, but much more profitable! In a nutshell, the love trade of three billion Chindians combined with the inflation trade of at least 500 million Westerners will soon completely restore gold’s shimmer and place as the ultimate asset. 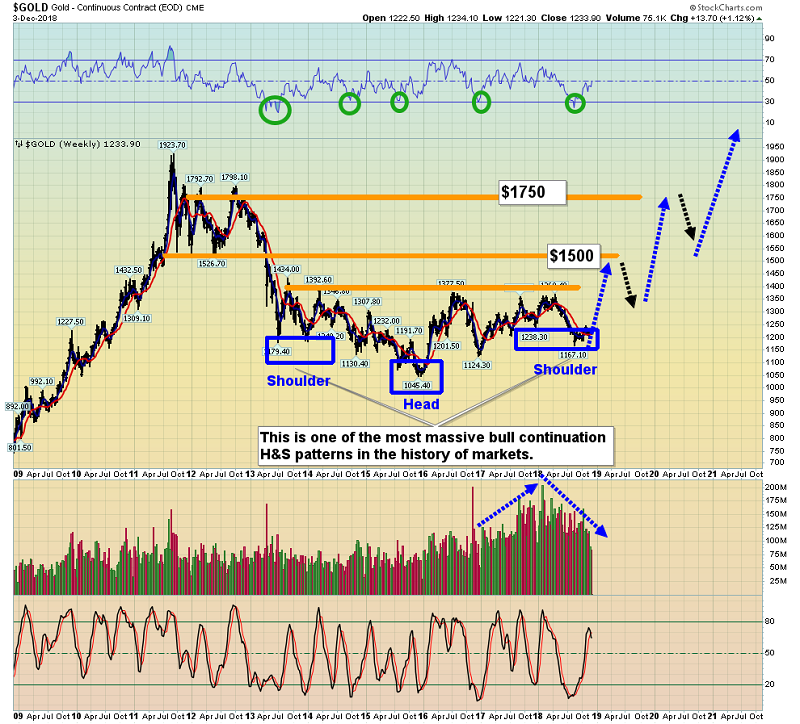 All investors should keep their eye on the price action taking place on this long term gold chart. Note the RSI oscillator. It’s poised to leap above 50 and that’s in sync with the arrival of Chinese New Year seasonality. Some heavyweight money managers believe that an inflationary surprise is coming to America, and it could happen as early as this Friday’s jobs report. A surprising uptick in US wage inflation is imminent and it will be a tremendous tail wind for silver’s upside price action. I don’t know if that inflationary surprise happens in Friday’s jobs report or not, but I do want investors to be positioned to get richer if it occurs! In the short-term precious metals market, I might be shorting GDX via DUST (although the good news is that I currently hold NUGT), but that has nothing to do with the fabulous long term fundamentals in play for the entire precious metals market. 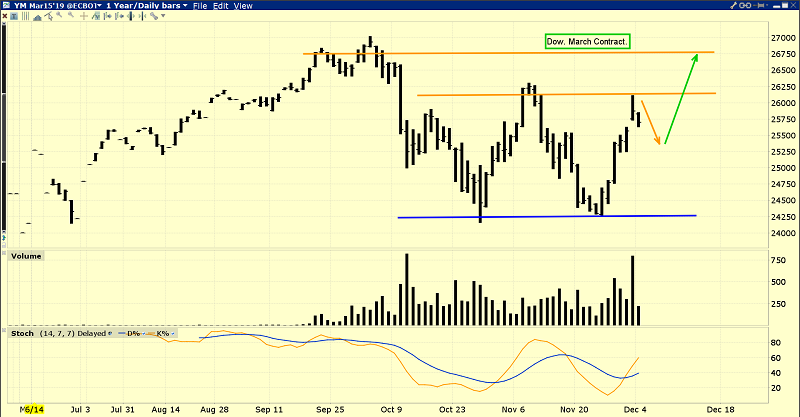 At my short-term www.guswinger.com trading service the average NUGT/DUST or UDOW/SDOW trade lasts only a week or two. I increased my average trade size threefold yesterday… to enhance the adrenaline rush and the profits, with professionally managed risk. Investors should always separate trading accounts from long term core position investing accounts. They are as different as night and day. Jay Powell had to “blink” with rate hikes and so did Donald Trump with tariff taxes or the US stock market would have incinerated yesterday. So, when Trump “supersized” Powell’s blink with his tariffs blink, the US stock market rocketed higher and I promptly sold half my UDOW swing trade position as the market opened. From there, the rally faded. Pros sold the news. In the big picture, I think most stock market bulls and bears are working a bit too hard to predict either “make my stock market great” higher prices or the end of the bull market. It’s simply later in the US business cycle now than it was a year ago, and it will be even later as 2019 gets underway. As the cycle matures, volatility typically grows and that makes analysts a bit desperate about trying to figure out what comes next. Reality check: What comes next is vastly much wilder price action than has occurred at any point in this bull market! That’s just what happens as earnings fade and inflation rises in an environment of debt worship. 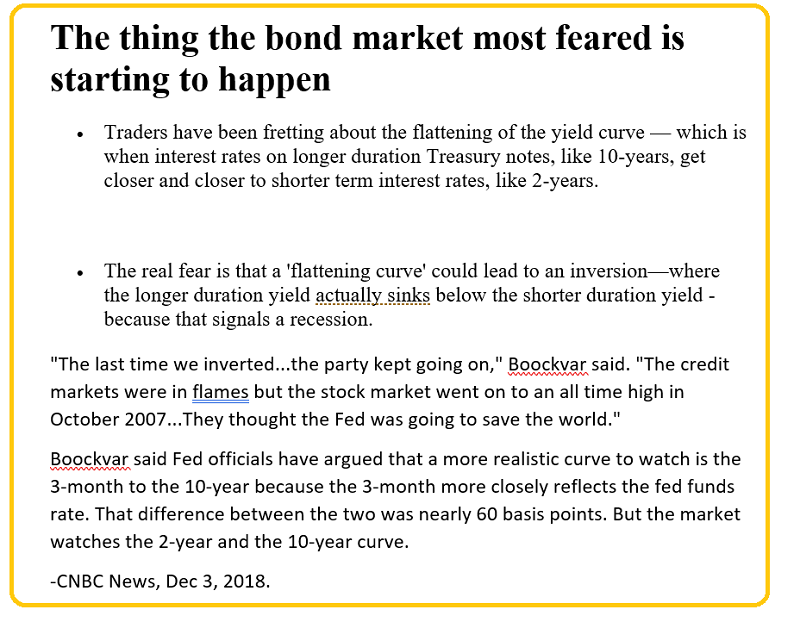 Whether it’s the US government’s maniacal obsession with debt growth and citizen extortion via income and capital gains taxation, the emergence of wage inflation, the negative effect of quantitative tightening on corporate stock buyback programs, or the inverting yield curve, what matters is that it’s all happening in the late stage of the business cycle. Price volatility is poised to go “off the charts” in 2019 as these forces intensify dramatically and synergistically. Stock market investors should not waste time trying to figure out what comes next. There’s only one course of obvious tactical action for long term US stock market investors, and that is: Reduce trade size now! 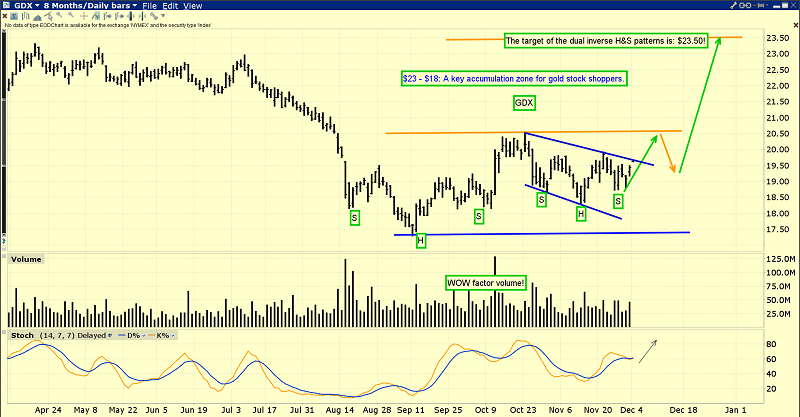 With the daily gold chart looking spectacular, what can gold stock investors expect? Well, for 2018 I’ve predicted that the “tax loss selling” of the past few years will be confined mainly to the tiny CDNX-listed juniors. GDX, GDXJ, and SIL and their component stocks are in great shape and poised to join gold in a “shotgun” move higher for the medium term. This is the GDX daily chart. 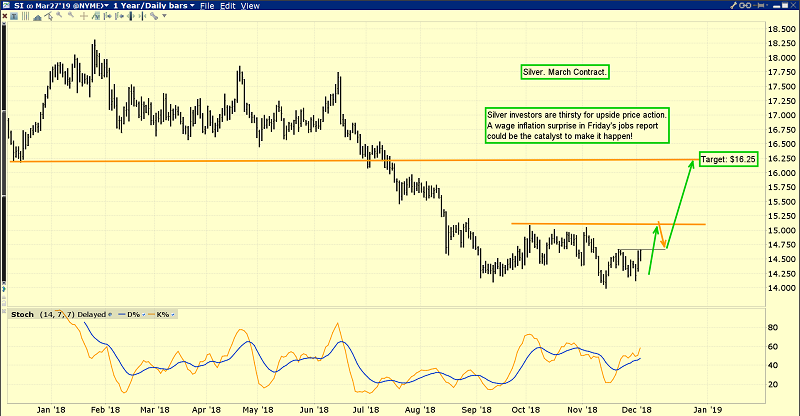 GDX is sporting dual inverse head and shoulders patterns. From a technical perspective, GDX can be viewed as a sports car with twin technical turbos that is revving its engine now. GDX appears poised to rise to the minor highs around $20.50, and then race straight to my $23.50 target zone! There could be some wild volatility around Friday’s jobs report and the December 19 Fed meeting, but the dual H&S patterns are a powerful technical force to be reckoned with. When both the short term technicals and the long term fabulous fundamentals are weighed carefully, most gold stock investors should be in great spirits and ready for the upside journey of a lifetime! Special Offer For Gold-Eagle Readers: Please send me an Email to freereports4@gracelandupdates.com and I’ll send you my free “Back Up The Golden Truck!” report. I highlight six under the radar junior gold stocks that could stage five bagger gains or more in 2019. I include key buy and sell signals for each stock!